People have been playing Mario since the early 80's, and the franchise has expanded and evolved to accommodate all sorts of gameplay to suit just about every gamer, with the Mario Kart series undoubtedly the pinnacle of multiplayer Mario mayhem and fun - our apologies, Mario Party - with its eighth console entry seeing an appearance on Wii U this year. In anticipation of this landmark event, we have decided to run through our list of the ten most fun, unique, innovative and every other positive adjective courses in the entire Mario Kart series. Okay, let's-a go! One of the most quirky courses in the series, Cheese Land is a planet made entirely of cheese. Mousers roam everywhere, so try not to drive into them. Hopefully they won't eat the entire course! Why is Cheese Land on the list? Because there is no course like it in the entire franchise, and there likely won't be another Cheese Land apart from a possible remake as a Retro GP course. It is unique. It is cheesy. It is fun. Care for a drive to the mall? How about a drive through the mall? This is Coconut Mall, the very first Mii-themed course in the series, with posters depicting various Miis saved in your Wii console's Mii Channel or your 3DS's Mii Maker. Miis litter the outskirts of the course, cheering on the drivers as they race for pole position. A few even get in your way in the parking lot, with a risk of driving into them as they attempt to park their cars. This course is a great example of showcasing your Mii collection in a way different from simply playing as them. Plus, you'll likely never have the opportunity to drive through a busy shopping centre in real life! Many courses in the series offer a few throwbacks to main-series Mario games, but only a few are actual levels transformed into a racetrack. Tick Tock Clock is based on the level of the same name from Super Mario 64, and it looks very much like its namesake, right down to the finest detail. It even has a catchy tune that adds to the vibe of being inside an enormous clock. It is definitely tied for best course in Mario Kart DS, and we certainly hope Nintendo adds it to a Retro Grand Prix in a future Mario Kart game. Super Mario Kart started the Mario Kart series, becoming one of the most popular titles by a considerably wide margin; even today, series vets like the skill-based and "no Blue Shell" gameplay of this classic slice of Nintendo gaming history. The first course that so many Super NES owners raced was Mario Circuit 1, a course so legendary that it has been remade no less than twice in other games in the series. Every Mario Kart game has at least one Mario Circuit, but there had to be a first. A true classic. Ever since gamers discovered the green dinosaur hidden in a block in Super Mario World, Yoshi has become a constant appearance in virtually every Mario-series spin-off, sometimes even bringing his multicoloured brethren with him. It was only fitting, then, that he have his very own course, a gigantic island in the shape of himself. It's the ultimate vanity portrait, complete with a helicopter in the style of the one featured in Super Mario World 2: Yoshi's Island. Once you realise the scope of racing on a giant picture of Yoshi, it soon becomes a favourite. Nobody would have thought of it in earlier games. Nobody who played Wii Sports Resort could have predicted it would happen. Nobody getting fit in Wii Fit Plus would have expected to race on it. A gigantic single-lap course around the entirety of Wuhu Island. It is one of the greatest accomplishments in the Mario Kart franchise, and proves that not everything in a Mario Kart game has to be from a Mario game. Most gamers know of the sometimes-infamous shortcut on Koopa Troopa Beach, the tunnel that cuts out half the course. This shortcut is tricky to access, but once you pull it off it provides a sense of reward. The remade course shortens the length of the shortcut by a considerable amount, but it still won't change the fact that Koopa Troopa Beach has become legend in the annals of Mario Kart history. The moment this course starts you find yourself being ejected to the top of a colossal pinball table themed around Waluigi, and from there it's a winding drive down to the bottom. Along the way you'll encounter gigantic pinballs, brightly-lit bumpers and a pair of flippers that will really send you flying if you don't watch where you're driving! A lot of people are disappointed that this was the only mention of Waluigi in Mario Kart 7, but at least it was the best possible mention of all. This course is arguably the greatest in all of Mario Kart DS. 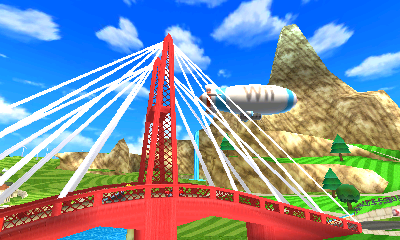 One of the greatest new features in Mario Kart 7 is the ability to glide through the air, and no course showcases this better than Rock Rock Mountain, with not one, not two, but three sections in which you eject your glider and soar through the skies. It is absolutely breathtaking to behold. The music even has samples of the main theme of Mach Rider, a non-Mario game for the NES, which adds to the overall experience. 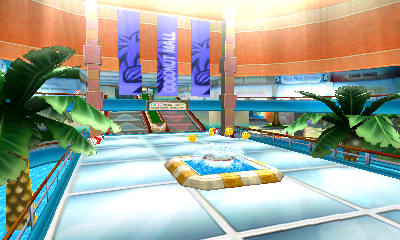 Truly a wonderful course and the pinnacle of what Mario Kart 7 aims to showcase. Waiting at the end of every Mario Kart game is Rainbow Road: a course suspended in space which is made entirely out of solid rainbows. Each new Rainbow Road innovates on the previous one, but the original started the formula which has become so iconic. With a catchy song, unique obstacles and no guardrails, it has stood the test of time, which is partly why it has been in three separate Mario Kart games. On this Top 10 countdown, why did we choose this Rainbow Road over the others? Because without this Rainbow Road the others wouldn't even exist. It set a benchmark, and it has become a classic. Well, that was our Top 10 Mario Kart Course countdown. Do you agree with our choices? What are your favourite courses in the series? Feel free to let us know in the comments below! Special thanks to Super Mario Wiki for the images used in this article! Maple Tree Way for me. I love that track. Great list dude. Nice list. My favorite course is Mushroom Gorge from Mario Kart Wii. Rukiafan wrote: Nice list. My favorite course is Mushroom Gorge from Mario Kart Wii. Maybe we should do a staff picks list, where each staff member names their top course. My favorite is MooMoo Meadows from Mario Kart Wii. Very nice list of tracks. Good list, but my favorite is Shy Guy Beach. My favorite course is Grumble Volcano. Great read. My favorite course has always been Mario Circuit 2 I think it was that was in the first Mario Kart on SNES. I just love the part when you hit the turbo tiles and jump over part of the track. I was excited to see it return in MK7. @Tinglemaster wrote: My favorite is MooMoo Meadows from Mario Kart Wii. Gahhh!!!! I hate thst track, i always crash into the cows, and peach beach, those bird things that chase you. I know a guy who rages hard on both those tracks. Rainbow Road from GCN was my favorite it so hard and is creative track. Sweet feature, my favorite course is Frappe Land from the classic courses on Mario Kart Wii. Those are some good choices for this feature!